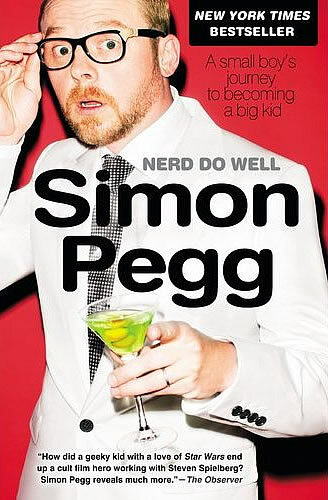 BOOK REVIEW: "SIMON PEGG'S NERD DO WELL"
You probably never heard of the name “Simon Pegg” though you have likely seen his face somewhere. Remember the nerdy computer programmer in “Mission: Impossible- Ghost Protocol”? Scotty in J.J Abrams’ “Star Trek”? Not forgetting the voice of Buck in “Ice Age: Dawn of the Dinosaurs”. The British funnyman’s first book, “Nerd Do Well: A Small Boy’s Journey to Becoming a Big Kid” chronicles anything from his upbringing, his love for stage and performance at a young age to his crush on an exchange student from France to his first sexual experience. Yes you got that right, Pegg is brutally honest about his growing up years and you should not be surprised the majority of this book is devoted to that chapter of his life which may or may not have direct influence on his later years. The self-proclaimed supergeek is outrageously funny as he describes his love for Star Wars most notably star Carrie Fisher and his frank dissection on the prequels is humourous. His style of writing is utterly relaxed and his rattling not in any chronological order. There are also chapters devoted to his best pal, actor Nick Frost and director Edgar Wright and his reactions after meeting icons such as Steven Spielberg and George Lucas. As an added bonus, Pegg also includes his 12-part serial short stories involving his alter-ego, suave superhero Simon Pegg and his robotic butler. It’s a pity Pegg didn’t spend more time talking about the movies he has worked on for example “Shaun of the Dead”, “Paul” and “Hot Fuzz”. Like he says, this is not a book to dish out the dirt at least for the record, we know he was once a teenage lifeguard, a geeky teenager and still remains a geeky 42 year old big kid. This is the perfect book for geeks straight from a geek who made good. Have fun.